Hubby, Kasper and I made a trip to Joensuu in eastern Finland to visit hubby’s son. 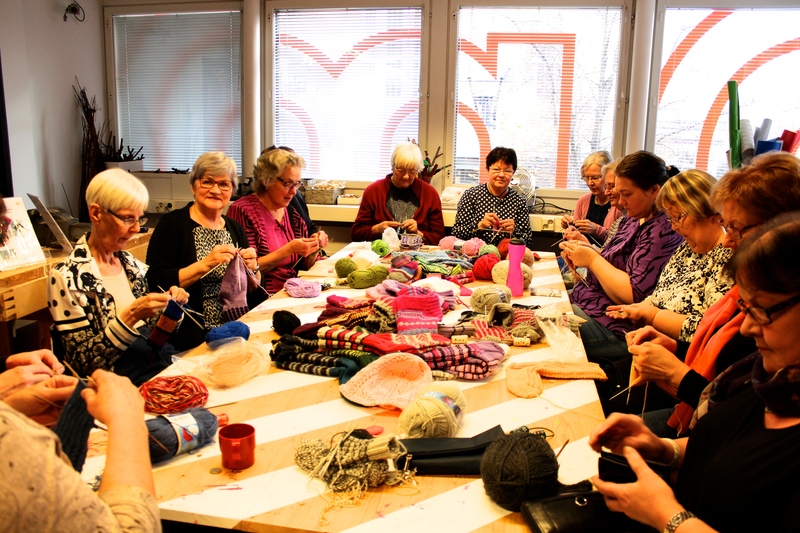 We took the southern route around the lakes so we could visit the Craft Museum in Jyväskylä. I was prepared for not seeing much of what I’d like to see most of all: knitting, crochet and fabric for clothing. And so it was. 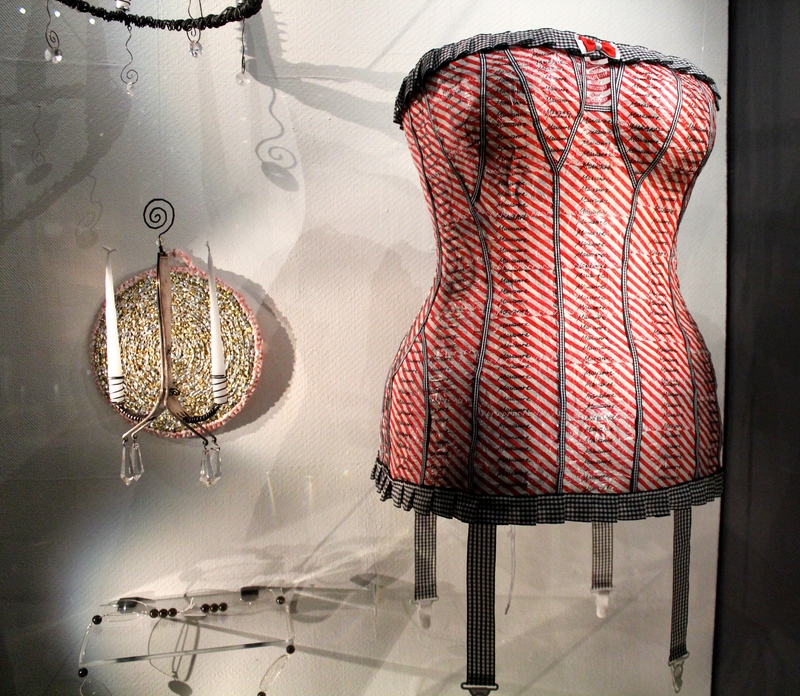 The reason for this is of course that showing these items in the museum’s permanent exhibition would damage them. But there was still much to see, and I strongly recommend a visit if you go to Jyväskylä. I’m sure you’ll be able to see items from the store rooms if you ask in advance. 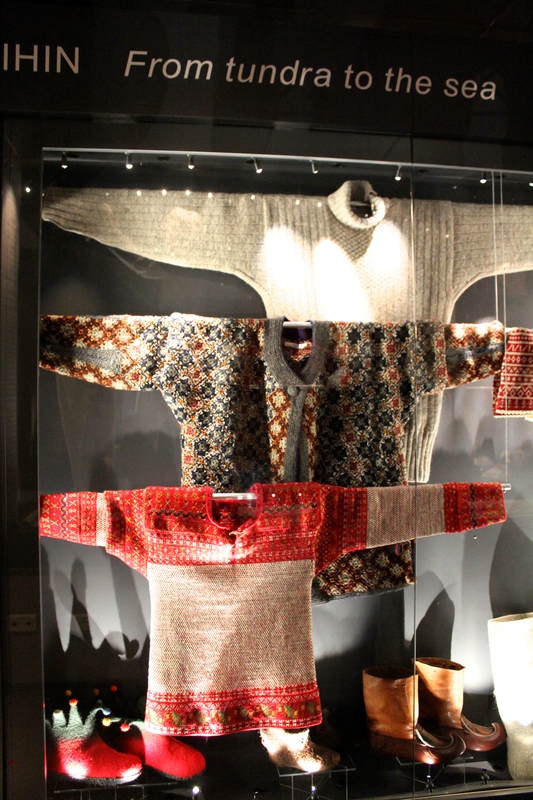 The costume find in Eura in 1969 has been much documented and discussed in Finland, and it’s been reconstructed with great care. The grave was from Viking time, 1020-1070. The discussion in our media was especially intense when our former president Tarja Halonen came to the independence ball dressed like this, and yes, she also wore the knife in her belt. 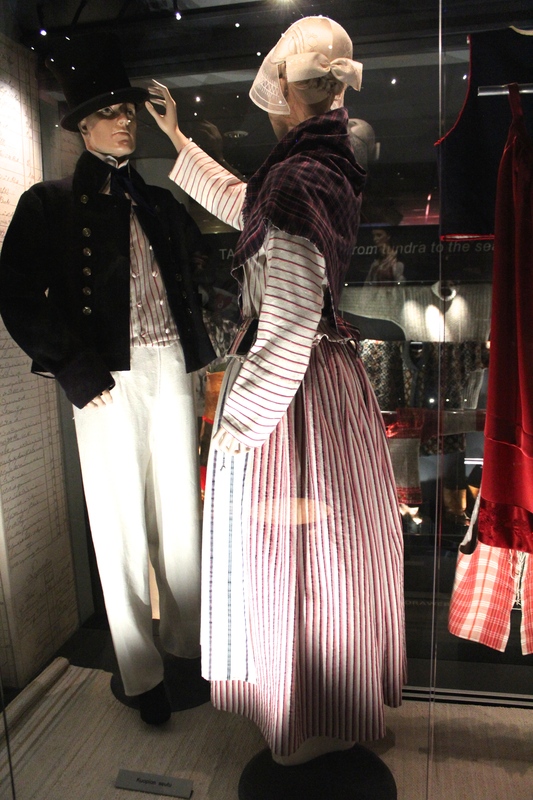 There are excellent pictures of old Finnish dress here, also one of our president: women’s dress. 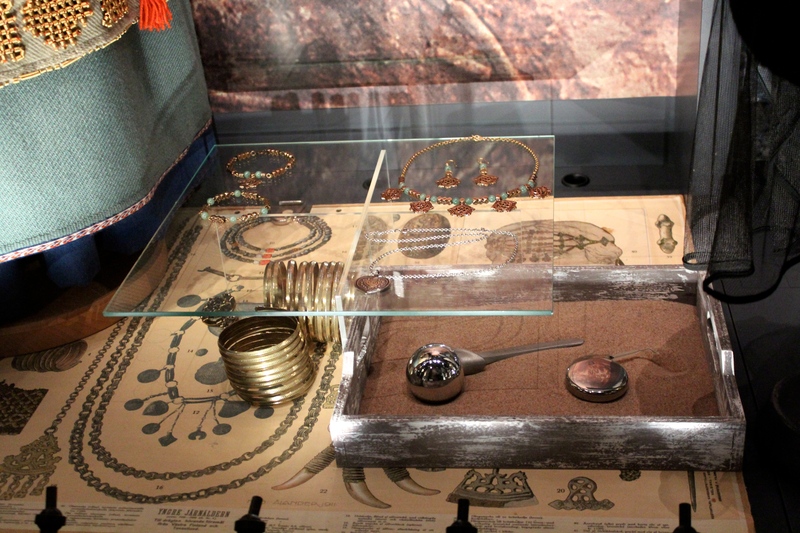 The rich women’s jewellery was striking in the Viking times, as nowadays. 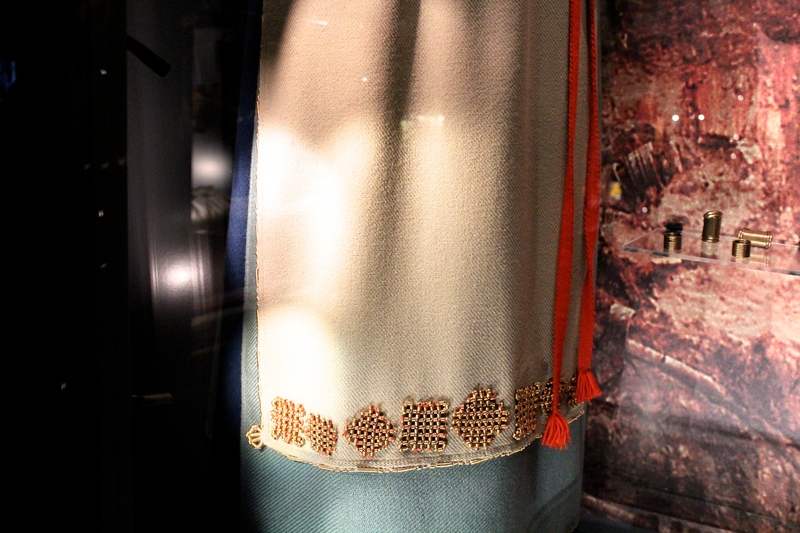 I like the bronze spiral embellishment in the hems. They add both beauty and weight to the apron, no unruly flapping in the wind here! The knitted and crocheted items were sparse. But here are three sweaters, from top to bottom: first the so called tikkuripaita, or the sweater from Hailuoto, an island in the northern Baltic Sea, then a crocheted granny square heavy cardigan made from left-over yarns by a woman from Pargas in southern Finland called Qvidi-Mina (both she and her cardigan), and then the Korsnäs sweater from Korsnäs on the west coast. 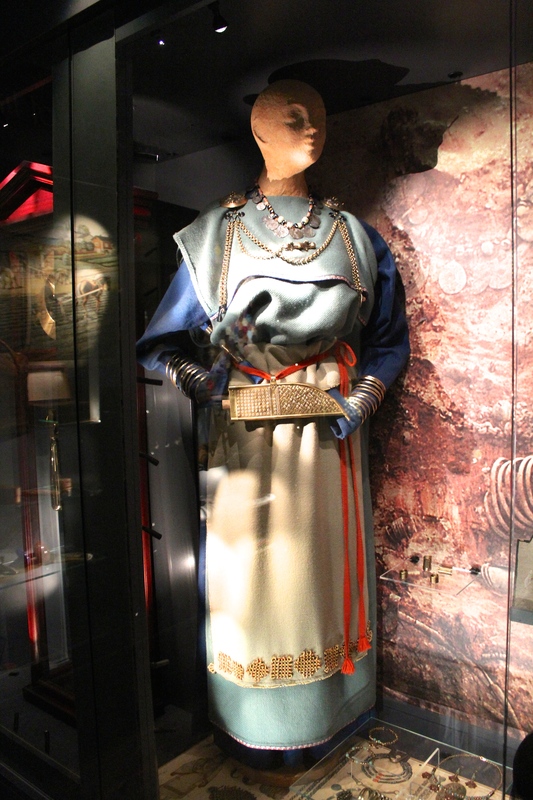 Qvidi-Mina was one of those women you can find all over the world. They have an eye for beauty, they have skilled hands, they make a meagre living by selling their products or changing them for goods or services. 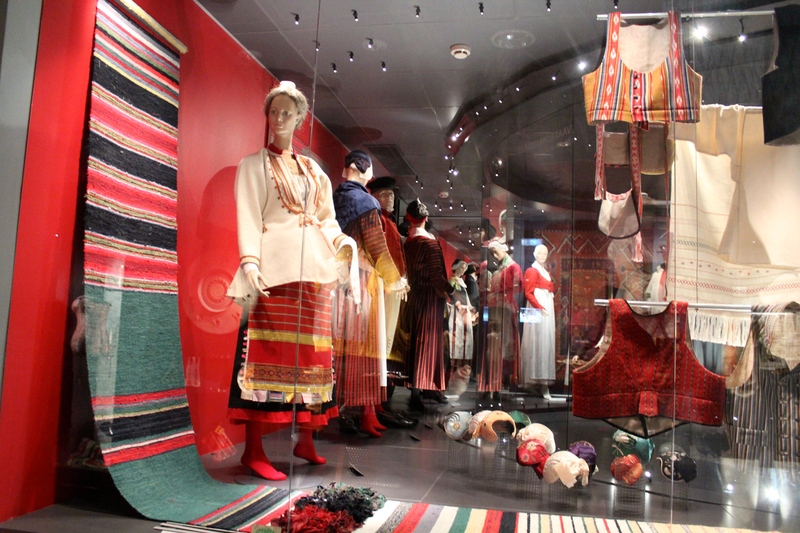 Luckily a woman in the neighbourhood inherited Qvidi-Mina’s textiles, and now you can see them in the museum in Pargas. I love the felted red boots! They are new. Felted boots in the old days did not look like that. The leather boots are still made, but typically for much that is made in our times, they are not made with such care and elegance as in older days. In the wild 70s and 80s I used such boots for years. They are nice in the winter, and excellent for walking in our stony woods also in the summer. 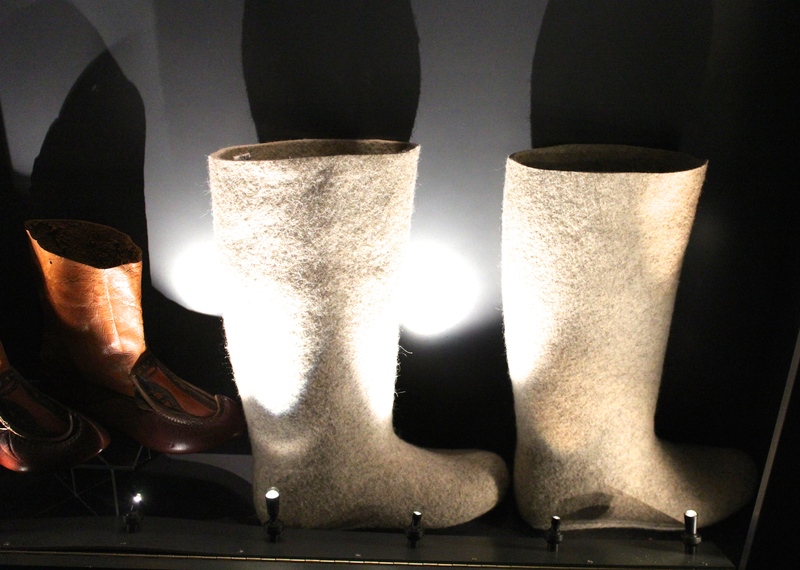 Now here’s what the felted boots looked like in earlier days. They are light and warm and at their best in very cold winters. I wore felted boots as a child in the 50s. But you have to remember: don’t use them when it’s raining! No, I don’t think you should go out in the rain dressed in that one either… of course, it depends on what effect you want to achieve. Now here’s a sweater and a sad love story that make people go soft. It’s a tikkuripaita. There was a girl and a boy, living as neighbours as best friends in their village in Hailuoto. Everyone thought they would marry when they grew up. Then came WWII. The boy, now a man, had to join the army and fight against the Russians. He survived, he came home – and found that his friend had married another. But she still knitted him a tikkurisweater. He wore it for the rest of his life. He mended it himself. He loved it. I’m sure he loved her also. What a post…….as usual!! 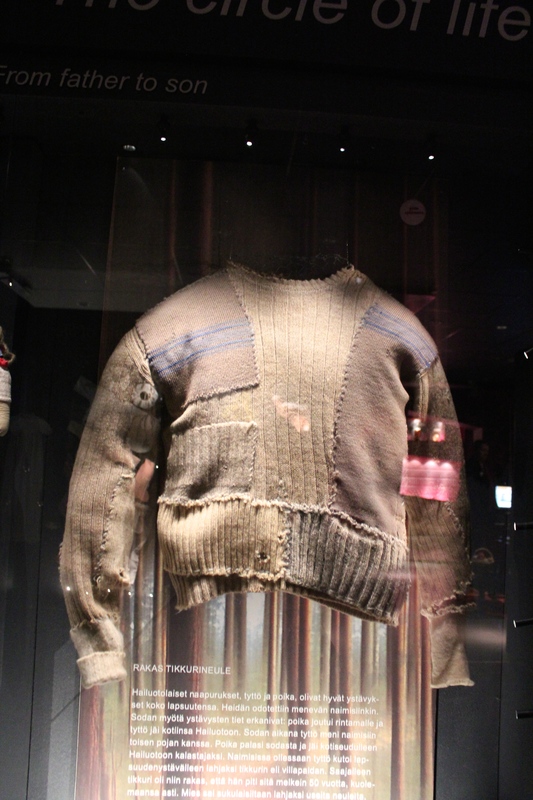 The clothing was/is spectacular and that sweater…I did indeed ‘go soft’. as a child I too had felt boots (red) that were worn inside rubber boots that had buckles, I am from northern New Hampshire and the boots were from Canada…I’d love a pair now! Red was a popular colour. Thank you again.